Okay, I have to confess that I have been really bad about about posting lately as I’m sure you have noticed. Why you ask? Well, I think I have been lacking that creative spark to write a post that really made sense. Also, I am trying to mix new recipes with some of my old recipes to keep the blog moving. Honestly, I am proud to just get dinner on the table as of late. In addition, I have been making a lot of stuff that I have already talked about on the blog. When that happens, it can be hard to find inspiration and energy to put together a new post. Funny to think that with the billions of recipes and food shows out there that there would be lack of material to talk about. My theory has been if it feels right and makes sense, then post it. Otherwise, don’t post it until you are sure it is what discuss on the blog. I am going to try something a little different with this post. It won’t have all the usual pictures, but enough that you will get the idea. Also, I am going to try a change in my naming convention too. Don’t worry, I’m not going to change the premise or the purpose of the blog for this one post. This is still about me, a home cook, just sharing my passion and some useful tips and tricks. Okay, on with the show! This is a super easy, weeknight dish that you could realistically put on your dinner table in about 30 minutes. Here is what the completed dish should look like. I think what makes this dish is the roasted tomatoes, which is an underutilized technique and very easy, in my opinion. You cut the cherry tomatoes in half, season with salt and pepper, apply heat–400 degrees, wait a few minutes, and consume. That is it! Even better, you can achieve the same affect on the stove top or you can even use your grill. Like any other vegetable or fruit, you are trying to get the tomatoes to give up their liquid and sweetness. Also, if you broil or grill the tomatoes you can get some of that charred flavor as well. It is amazing and worth the time to treat the tomatoes this way. Ready to make this little bit of magic? Here we go!! Bring 4 quarts water to a boil in a large pot or dutch oven. In large saute pan, on medium high heat with a 1 tablespoon of olive oil, cook the mushrooms until browned on both sides. This should take 4-5 minutes. Once they are done, you can set them aside. *On low heat, in the same pan, let the garlic warm in the pan with a little bit of olive oil and stir occasionally for about 5 minutes. Pull the garlic out and set it aside with the mushrooms. Combine first five ingredients and place them in a baking dish, mixing well to coat. Bake mixture at 400° for 15-20 minutes or until tomatoes are soft and lightly charred in places. While the tomatoes are cooking, season boiling water liberally with salt and add pasta. Cook until your pasta is just slightly under cooked. The pasta will finish cooking in the sauce. When you pull the tomatoes out of the oven, add three tablespoons of chicken stock to help loosen brown bits off the bottom baking dish and to help reinforce the tomato sauce. 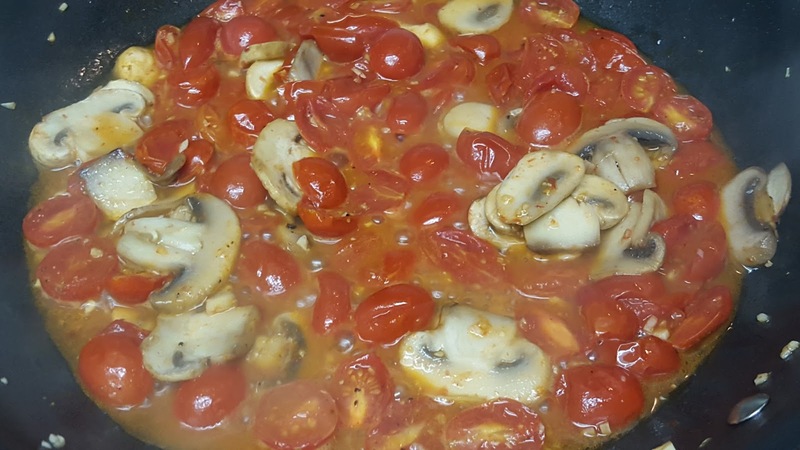 To your pan, add garlic, mushrooms, protein (if you want), tomato mixture, and cook on medium heat for about 4 minutes to thicken sauce. Finally, add pasta and cook another 2 minutes until pasta is warmed through and still al dente. Last but not least, sprinkle in basil and spinach and stir for 30 seconds. Top with cheese, if desired. Time management. This recipe has one pit fall, which is the timing between the tomatoes and pasta. We want the tomatoes to retain some of their shape and texture while not letting the pasta get overcooked. Start the tomatoes first and after about five minutes you can start your pasta. From my experience, most pastas cook in about 12-15 minutes, and if the tomatoes have to hang a little longer it won’t be the end of the world. As I have said before, mistakes happen and we just move forward to fix them. *Garlic. Garlic is one of my favorite ingredients and pretty much gets eaten with every meal except when it comes breakfast and cereal. I have yet to find a good combination for that. Anyway, the real point is that garlic can go from delicious to overpowering in a New York second. So, as I was mentioning earlier, if you cook the garlic low and slow you can retain the flavor but will remove the chance of having bitter, burnt garlic. Take it from me, it doesn’t make the dish taste good and will take over! If you like a little more intense flavor add it into the pan right before you add the roasted tomatoes and still just let it mellow in the sauce from about 5 minutes. If nothing else, roast the garlic with the tomatoes and just keep an eye on it so it doesn’t burn. If you are looking for a few ways to take this to the next level, then here are a few ideas for you. If you want a little more heat, you could add a pinch of red chili flake when you are starting to pull the sauce together. Also, you could make your own pasta to make this dish spectacular. Speaking of that, fresh pasta would make time management of this dish a breeze. Since the pasta cooks in less than five minutes you can cook the pasta at the very last second before you serve the dish. Also, you could add some fresh mozzarella chopped up or some goat cheese right when you sprinkle in the basil and spinach. Or, you could do one of my favorites, which is sprinkle in some arugula just until it begins to warm through and wilt. I should mention this would a great vegetarian dish as well! The sauce gives plenty of body and you hardly miss the meat. 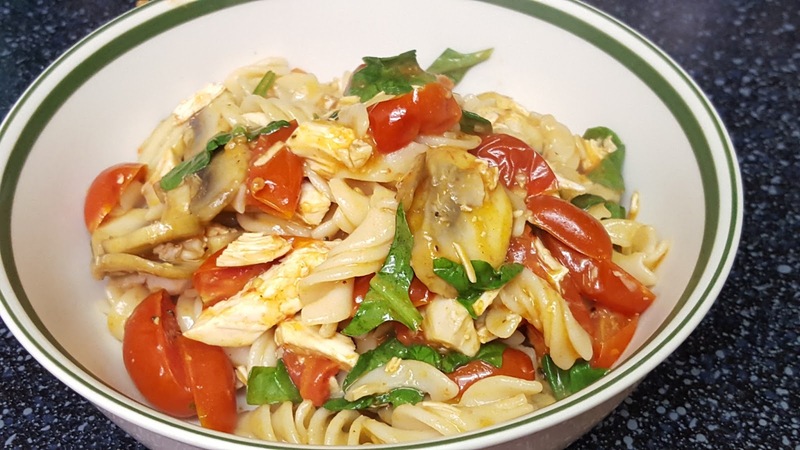 In addition to the mushrooms, any other vegetables would be a perfect fit into this pasta dish. If you want, you can add a little chopped up meat, your choice, to this dish. Again, you could go either way and it would still be delicious. Guess what? That is it! We are done! I know, hard to believe right? Well, once in a while even a blind squirrel finds a nut. As usual, let me know what you think about this recipe. Comment on the post or send me an email. I would love to hear your thoughts. Enjoy!